Cross Harbor Rail Freight Tunnel Would Reduce Congestion on Roads and Bridges, Improve Air Quality and Create 18,000 Jobs. Photo by: Governor Andrew M. Cuomo, via Flickr. Albany, NY - May 5, 2017 - Governor Andrew M. Cuomo and Congressman Jerrold Nadler today announced a major milestone for the Cross Harbor Freight Movement Project: issuance by the Port Authority of a RFP for consultants to conduct the Tier II Environmental Impact Study and complementary advanced planning and engineering work. The Tier II study will thoroughly explore the execution of a cross-harbor freight tunnel, identified in Tier I as one of the solutions to alleviate severe traffic congestion, reduce dependence on aging roads and bridges, and solve the region’s freight problem by finally connecting New York City directly to the national freight rail grid. The tunnel would run between an existing rail yard in the Greenville area of Jersey City to connect with existing rail infrastructure in Brooklyn. The Port Authority has committed up to $35 million for the study and has available up to another $35 million for further design and engineering. "New York leads the nation in tackling the largest and most complex infrastructure challenges head on, and this project will identify an innovative, 21st century solution to streamline congestion and support economic growth for generations to come," Governor Cuomo said. 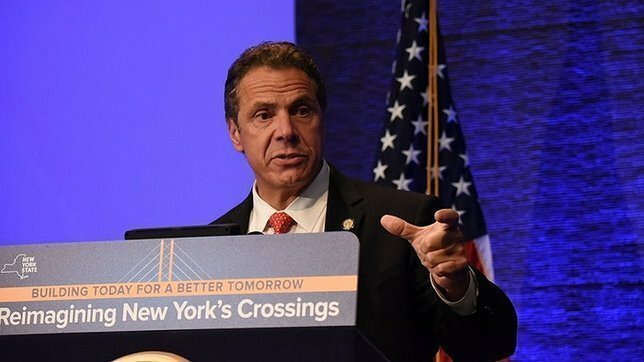 "After generations of neglect, New York is once again building for the future, and by investing in world-class transportation projects across the state, we drive economic activity and help make our great state even greater." Congressman Jerrold Nadler said, "The Cross Harbor Rail Freight Tunnel project, which I have supported for more than 30 years—from my time in the State Assembly to serving in the U.S. Congress—will finally connect the New York metropolitan region to the national freight rail grid by removing trucks from our streets and diverting them to the underutilized rail network. It will change the way we move goods throughout our region for the better, with economic, environmental, health, safety and cost saving benefits for millions of people. I want to especially thank our Governor, Andrew Cuomo, who has been a strong long-term advocate for this project. He is a leader who seeks to solve the toughest of problems, and I have tremendous respect for that. I also want to congratulate the Port Authority, the Federal Highway Administration, and the coalition of elected officials, business and labor leaders, and transportation and environmental advocates who have supported this project from the beginning, and thank them for their tireless work in getting us to this important milestone." New York City is the only major city in the world that is not directly connected to its country’s national freight rail network. Without this key rail link, more than one billion tons of freight move through the greater New York region each year primarily by truck, with truck congestion adding an estimated $2.5 billion annually to the cost of delivering goods to consumers and businesses. Trucks transport about 90 percent of the freight, while rail handles only 2-3 percent—with most freight arriving by rail at points west of New York and relying on trucks to reach their final destinations. It costs as much to move goods from New Jersey to Manhattan as it does to move them 500 miles or more in some other areas of the United States. In the next 20 years, freight to, from, and through this region is expected to increase by at least 37 percent – beyond the capacity of our roadways, putting a lid on economic development. The Cross Harbor Rail Freight Tunnel would fundamentally help reduce congestion on roads and bridges, improve air quality and reduce asthma, as well as allow better movement of emergency vehicles and buses. It would greatly decrease the cost of goods and of doing business by improving the efficiency and cost of freight delivery. It would also create a necessary redundancy in this critical transportation system, thereby fortifying a national security vulnerability. The Cross Harbor Rail Freight Tunnel would remove 1,800 trucks from New York Harbor crossings per day or half a million trucks per year. The Port Authority and the Federal Highway Administration completed a draft Tier 1 Environmental Impact Statement that was published in November 2014, and following public hearings, stakeholder review and comment, a Record of Decision for the Tier 1 was issued by the FHWA in January 2016. The Tier II study will also evaluate an enhancement of the existing railcar float-barge operation. Governor Cuomo is investing $100 billion in infrastructure projects across New York to promote economic development, create jobs, and expand opportunity. These investments enable New York to rebuild and modernize its roads, bridges, broadband networks, public buildings, and other critical infrastructure across the State while putting thousands of New Yorkers to work. Governor Cuomo has jumpstarted long-stalled or long-overdue projects, such as the Tappan Zee Bridge, the transformation of LaGuardia and JFK Airports, the Gateway Tunnel project between New York and New Jersey, and building a new Penn Station. Subject: LongIsland.com - Your Name sent you Article details of "Governor Cuomo And Congressman Nadler Announce Milestone In Cross Harbor Freight Project"